After a day or two of above freezing temperatures we are finally starting to see some of the driveway beneath the layer of ice that's been there since the ice storm in December. I'm unreasonably excited about this. There has also been a bit of a let-up in the succession of snow storms and snow squalls recently - the wind has been in the wrong direction for picking up snow from Lake Ontario and the jet stream has either been taking the snow further south or bringing rain over us. I was reading about how rapidly the Arctic is warming and how this is affecting the weather both here and in the UK, where it's been so wet this winter. 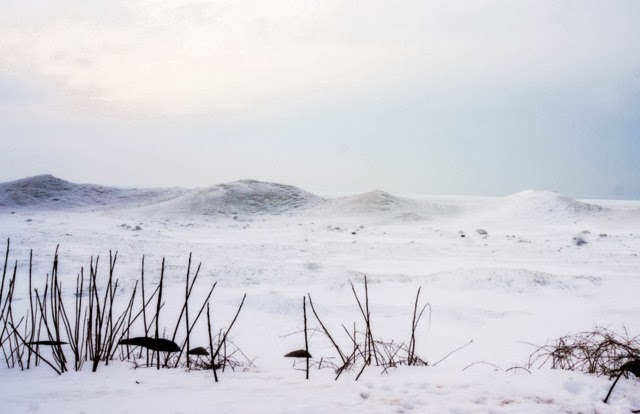 The retreat of ice in the Arctic is depressing. 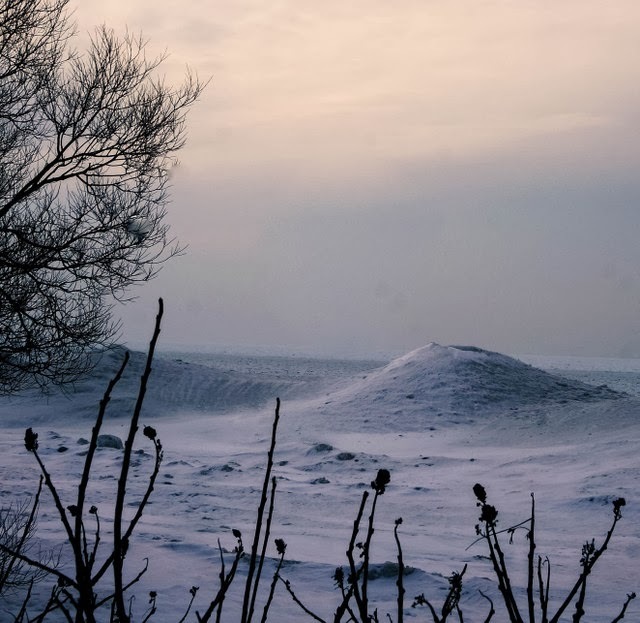 The weather conditions this year have created ice volcanoes in places along the Lake Ontario shoreline. I stopped to take pictures of some on the north side of Wellers Bay this morning, on my way home from running some errands. They give the impression more of a moonscape than a lakescape! Further down the same road is a patch of open water, where swans and geese congregate in large numbers. The clear skies and snow cover gave this morning's sunrise a peaceful pastel palette. The solar panels were particularly pink in the first rays of the sun - with one mysteriously clear of yesterday's snow, giving the array the impression of a gap-toothed grin. I waded through the snow to the greenhouse today, thinking about the parsnips I've still got in there and wondering whether they'd be dig-uppable. Luckily the eastern doors slide, otherwise I would not have got inside. I took a fork to the parsnip bed, but it is still frozen solid, so no joy there. I left the greenhouse to its winter peace and solitude. Outside, it's still just about the snow. We did get a bit of rain for a change on Saturday, which means that the driveway is back to the December layer of ice again. But everywhere else is still pretty snowy. But the sun was shining and it's now setting well past five o'clock, so the year is turning towards summer, even if it does feel like a long way off.